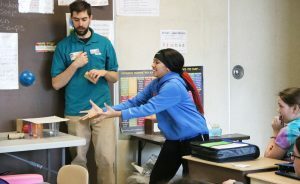 OSWEGO – At the tail-end of their academic unit on Newton’s Laws of Motion, Kingsford Park Elementary School sixth graders enjoyed an interactive visit from the Milton J. Rubenstein Museum of Science & Technology’s “Science on the Go” program. Kennysse Brockington, a Kingsford Park Elementary School sixth grader, readies to catch a ball during an ‘astronaut catching game,” as part of an experiment related to Newton’s Laws of Motion. That activity, and several others, were featured in a presentation from the Milton J. Rubenstein Museum of Science & Technology’s Science on the Go program. Sixth grade teacher Kristyn Frost said the “Ready, Set, Go” component helped students gain an even better understanding of the science unit, as they prepare for a culmination project where they will create their own object and show how it uses Newton’s Laws of Motion. Several student helpers were thrilled to partake in experiments alongside Matt Fagan, MOST science educator. Before the fun activities commenced, the students shared with Fagan what they already learned about: Newton’s first law, commonly known as inertia, as an object will remain at rest until it changes due to an external force; Newton’s second law, which explains how the velocity of an object changes when there is an external force; and Newton’s third law, which states that for every action or force, there is an equal and opposite reaction. The students were able to help demonstrate all of that when they assisted Fagan with a game of catch, watched a football spin, held a bicycle wheel as it went around, experienced why there are ‘sweet spots’ on baseball bats, witnessed a bucket full of materials swing 360 degrees without the objects falling and other experiments.